With factionalism refusing to die in Zanu PF, anxious power-brokers in the party are scheming to keep President Emmerson Mnangagwa at the helm of both the former liberation movement and the government for the next decade, the Daily News can report. Well-placed sources who spoke to the newspaper yesterday said the move by influential Zanu PF officials in its provincial structures was intended to keep at bay “ambitious” party bigwigs who stand accused of harbouring “unwelcome presidential ambitions”. All this comes after one of Mnangagwa’s two deputies in the party and in government, Constantino Chiwenga, recently told Zanu PF supporters that Mnangagwa was “the chosen one” — in a surprising public re-endorsement of the president which fired anew raging speculation that a faction in the former liberation movement wanted the Zanu PF leader to serve only one term as president. It also comes after Mnangagwa himself had, from the blue, hinted in September that he would serve his two terms as the country’s president, in line with Zimbabwe’s new Constitution. What makes all these developments more interesting is that Zanu PF will hold its annual conference in Esigodini, Matabeleland South, next week — where Mnangagwa will address party delegates for the first time since he dramatically assumed the leadership of the former liberation movement last year. One of the sources who spoke to the Daily News said provinces were “stampeding” to nominate Mnangagwa as the party’s candidate for the country’s 2023 presidential elections — a mere four months after the Zanu PF leader began his first term as head of the country following the hotly-disputed July 30 polls. In this regard, Harare, Bulawayo, Mashonaland West, Mashonaland East, Matabeleland South and North provinces, had already endorsed Mnangagwa as their 2023 presidential candidate. It was also taken as a fait accompli that the remaining provinces, which include Masvingo and Midlands, would also soon follow suit. of-the-moment” — which is why he had the support of all party structures. “Yes, everyone is endorsing him because he is a very popular leader. He was elected recently and what has changed since then? “You cannot elect me today and remove me tomorrow. He is indomitable. 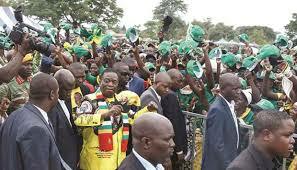 I think the provinces are doing the right thing because we have the best candidate,” Khaya Moyo told the Daily News. Speaking at a “thank you” rally at Murombedzi Growth point last month, Chiwenga told thousands of party supporters that Mnangagwa had allegedly been anointed by God as the “chosen one” to lead the country until he decided to leave. “Do not even think that in the following years there will be a vacancy in the presidency because that is not going to happen. “All those who were making noise about becoming presidents recently should remain silent and not utter a word. “He (Mnangagwa) has not done any harm to anyone. This country will never find another leader who is as compassionate and God-fearing as him,” Chiwenga said. Interestingly, both men had also pooh-poohed persistent media reports that their relationship was shaky because of Chiwenga’s “unbridled” presidential ambitions to succeed his boss. Speaking to American cable television network CNN in September, when he was in New York for the United Nations General Assembly meeting, Mnangagwa said he would not cling on to power like former president Robert Mugabe had done, but would still want to serve his permitted two terms if he was re-elected in 2023. The old constitution was partly blamed for having helped to entrench Mugabe’s ruinous rule which saw him lead Zimbabwe for nearly four decades. Meanwhile, some political analysts say Mnangagwa’s endorsement by his colleagues was “probably necessary”, to show outsiders that there was unity in Zanu PF. “In terms of presenting a coherent leadership that is accused repeatedly by the media and analysts of having major divisions between the president and his VP ... it is important for Zanu PF, especially in provinces where internal divisions continue to manifest such as Mashonaland West, to rally behind the party leader,” Piers Pigou, a senior consultant with Crisis International Group, said. “Zanu PF is panicking ... there is an issue of legitimacy. By their own admission, less than half of the electorate voted for them and every one knows that Mnangagwa is on very shaky ground, which is why you have hired guns endorsing him,” weighed in academic and researcher Ibbo Mandaza. should be on the economy. “These are early manoeuvres in the race for succession, which have been rumbling below the surface since Mnangagwa first attained power.